A pin to make life a little bit easier! Click on the red Save button on the top of the image to add it to Pinterest! We visited Tokyo at the beginning of 2018. 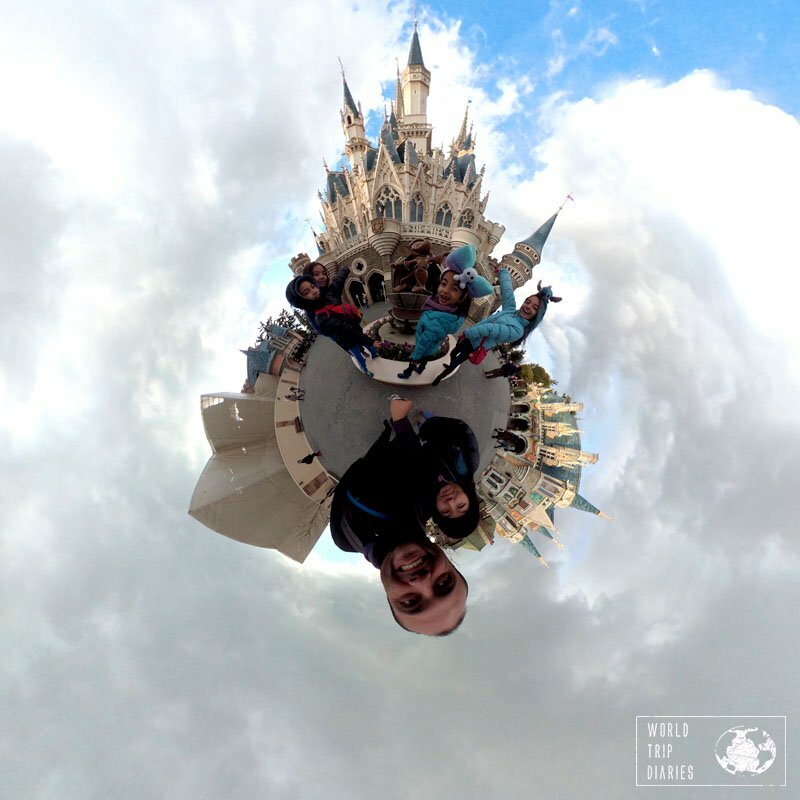 We couldn’t miss Tokyo Disney – we love it. Since last time we only visited Disney Sea, we decided to splurge a little and do a bit of it all. So we booked a Disney hotel and 2 days of parks. 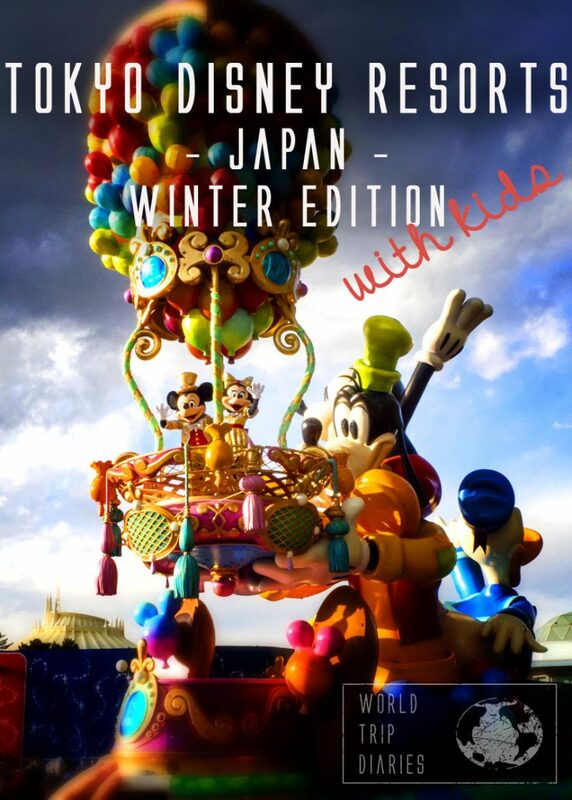 Continue to know more about Tokyo Disneyland and Disney Sea in winter with kids. * This post may contain affiliate links, which may give us a small percentage, without any additional cost for you. The Tokyo Disney Resorts have the 2 main parks, Disneyland and Disney Sea, a shopping center called Ikspiari, and the 3 Disney Hotels (Miracosta, Tokyo Disneyland Hotel, and Celebration Hotel). I’ll separate them all below to make things easier, so keep on reading! Click here to find the prices for the hotels in the Tokyo Disney Area! It’s the main park, pretty much like the other Disneylands, and the equivalent to Orlando’s Magic Kingdom. It’s beautiful, crowded, and fun. Great for kids and grown-ups of all ages. It’s probably the best park for multi-generational trips, as it pleases everyone. It’s divided into areas: Westernland, Critter Country, Adventureland, Fantasyland, Toontown, Tomorrowland, and World Bazaar. You can buy your Disneyland ticket online here! A selfie in Disneyland Tokyo! It always amazes me to see how these castles are perfect! I love them! 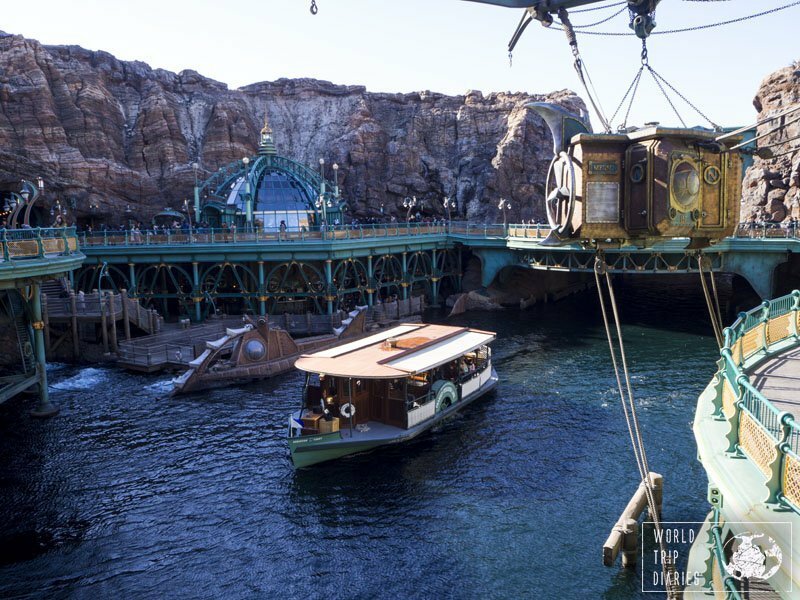 Disney Sea is a whole different park, different from the Disneys all over the world. 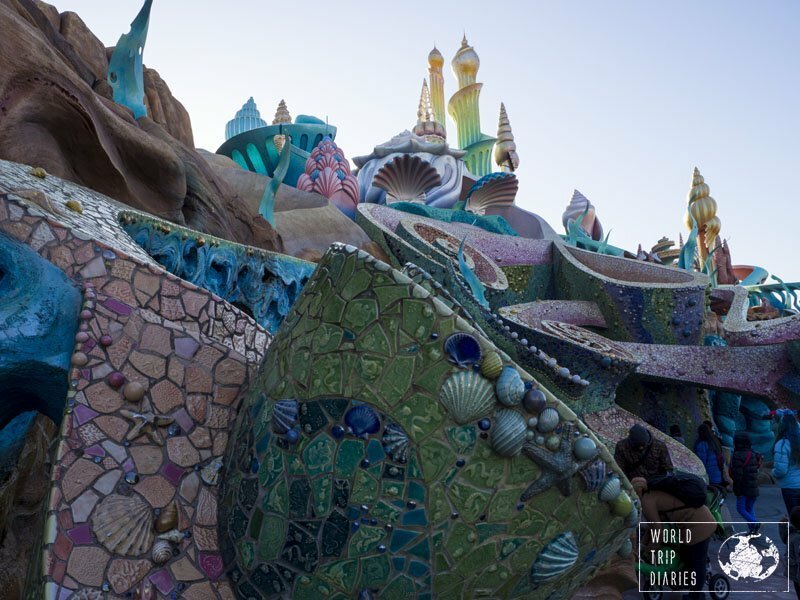 It’s stunning, and the Mermaid Lagoon and the Nemo and Dory areas are great for little kids, while the rest of the park is more for the older kids. I believe kids 8+ will enjoy this park better but it’s still worth the visit! It’s also divided into themed areas: Port Discovery, American Waterfront, Arabian Coast, Mermaid Lagoon, Mysterious Island, Lost River Delta, and Mediterranean Harbor. Grab your Disney Sea ticket here! 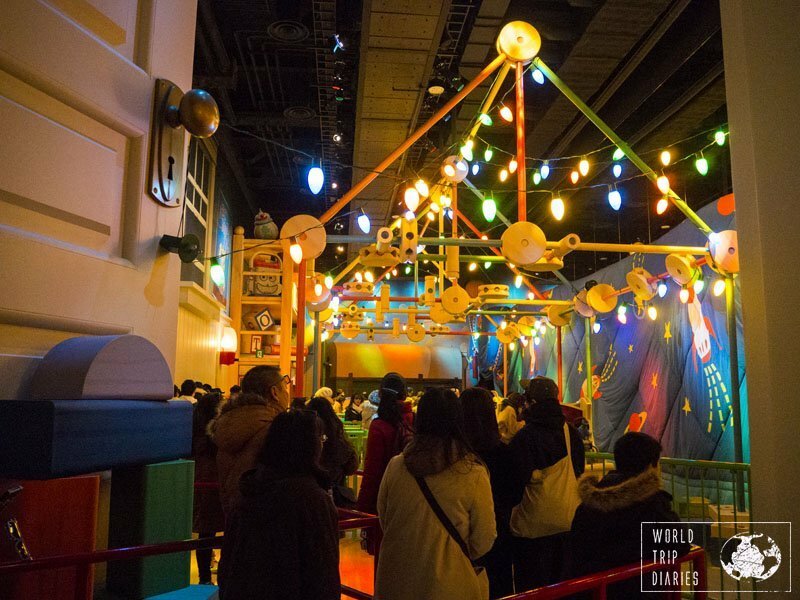 Disney Sea’s Toy Story Mania ride’s line! Isn’t it lovely? 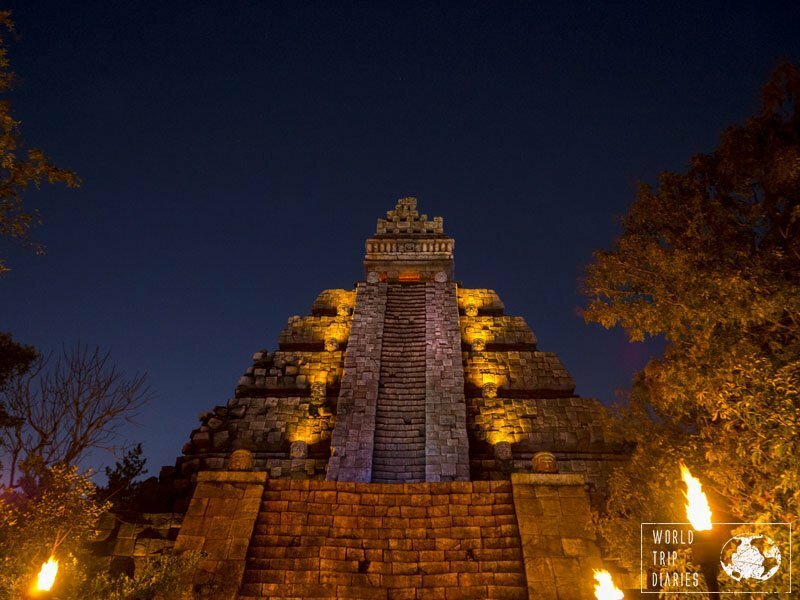 It’s one of Tokyo Disney’s most popular attractions! Ikspiari is Disney Resorts’ mall. It’s big, it has some nice shops, coffee shops to rest, movie theaters, a fun restaurant street, a lovely Disney Store, and so much more. We went out to explore it on our last day. We had the time between hotel check-out and Tokyo apartment’s check-in hour. Inside Ikspiari – it may be a good idea – if you have the energy – to go have dinner there after a full day at the park. The food is a lot better than the food offered inside the parks, for sure! There are 3 hotels in Disney, and they offer a few perks, like early entry. It’s only 15 minutes BUT we managed to ride 2 popular rides that usually have long lines in those 15 minutes (Toy Story Mania and Tower of Terror! ), so take advantage! The hotel buses are pretty, comfy, and very reliable. What I love about the hotels is that children up to 10 years old can share the existing beds and stay for free, so we got a room for 4 people and stayed in 6 – I need to say that it was comfortable, and not all crammed up. Other benefits of staying in a Disney hotel are that you have guaranteed entrance to the parks, whether you buy your tickets in advance or not*, the early entry of 15 minutes, there’s the Multi-Day Passport Special (allows you to visit both parks from day one), and depending on the hotel, you can have your shopping delivered straight to your room. * When the park is full, or the tickets sold prior are too many, they close the sales for that particular day. If you stay in a Disney Hotel, you have guaranteed entry, even if the park is full. This is inside Celebration’s Wish hotel. It’s not the room – unfortunately. But the rooms are cute too. Miracosta is Disney Sea’s hotel. It’s literally INSIDE the park. Very pretty, very expensive. You don’t even need to line up to enter the park: there’s a private entrance for guests there. With a Mediterranean decor and looks, it should be great. This is Disneyland’s hotel, but it’s not inside the park. It’s very very charming, like a castle. Also very expensive. For character dining, this is the place. These are actually 2 hotels: Wish and Discover. Wish has more of a fairytale feel to it, while Discover has a more adventurous vibe. They’re both lovely. We stayed in Celebration Wish and we loved it. The kids under 110 cm (3.6 ft) receive a little bag with PJs, toothbrush, and slippers that Coral loved. She was a bit over the size, nearing 120 cm, but even a bit short, she loved the PJs. She was really disappointed when she found out she had to leave it at the hotel. Check this out. This is the hotel guest’s early entrance gate – the regular entrance was even more crowded. It was still low season. There is a 24-hour convenience store, a Disney Store, and a restaurant that only opens for breakfast. It was fun buying the tickets at the machine (in front of the restaurant) for breakfast. It’s a simple breakfast (a few different types of bread, salad, fruits, sausages, hamburger, eggs, soup, juices, coffee, tea, milk) in a buffet style and cost ¥1300 for 12+. ¥900 for 6-12, and 5 and under are free. The daybeds are wider than the regular beds, so I slept with Jose (he was 10) in one, and Angelo slept with Coral (she was 5) on the other, while Melissa and Joao slept on a bed each. It was perfectly comfortable, but maybe it’s because both Coral and Jose are small. Service is great, and they offer a bag storage free of charge, beside bus transport to the parks. The monorail is paid. The bad thing about it is that it’s actually 20 minutes away from the parks by bus. The price difference, though, was worth it. They could make the castle into a hotel, now, couldn’t they? It’d be awesome even if we were stuck there with no way out during the night! Around Tokyo Disney, there are many other hotels with a partnership with Disney, offering a free shuttle to the parks, and a few other perks. Some of them – most, actually – are closer to the parks than the Celebration Hotel. The bad thing is that you don’t get the 15 minutes early entry and that they were all more expensive than the Celebration when we booked. 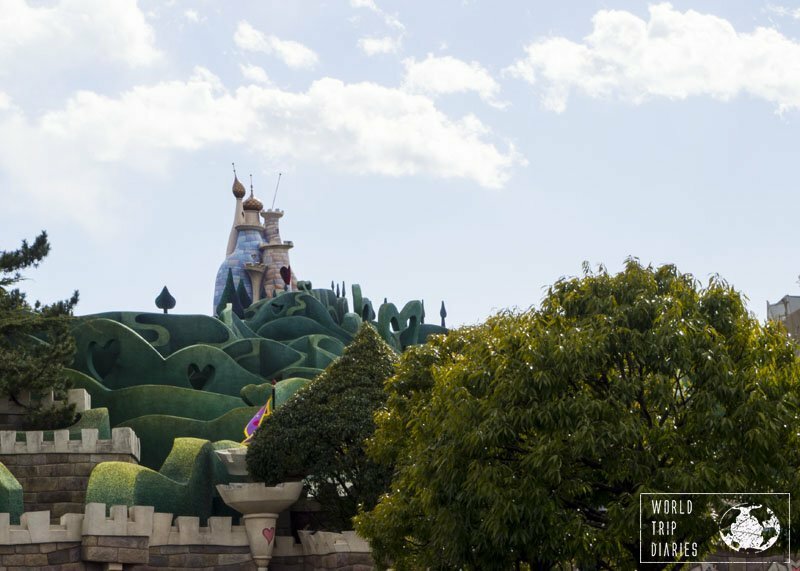 Katy, from Untold Morsels, have been to Hilton Tokyo Bay and shared a review of this Tokyo Disney Partner Hotel with us. If you are keen to stay near the Disney Parks in Tokyo, the Hilton Tokyo Bay is an excellent choice. One of Tokyo Disney’s partner hotels, the Hilton has a shuttle bus connection to the resort train. It only takes 2 minutes so you can even walk to the train station. 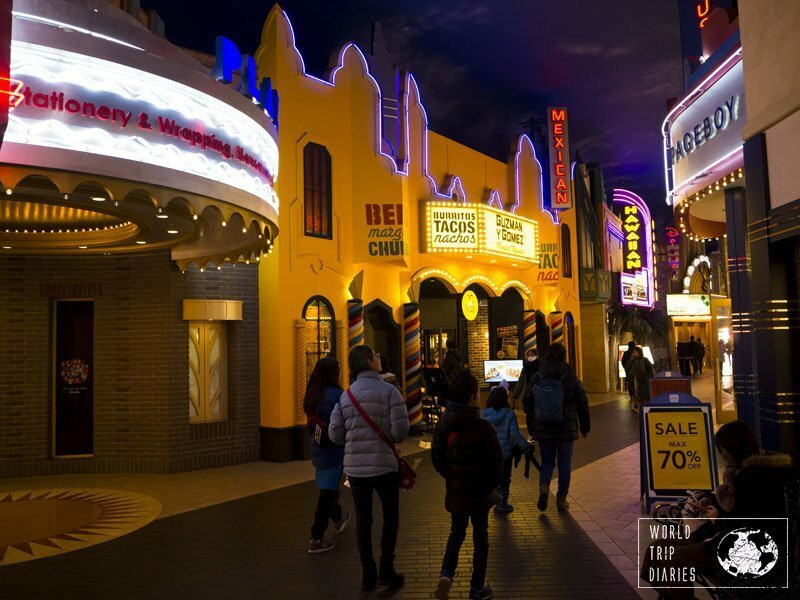 Guests at the hotel are able to purchase guaranteed entry tickets for Disneyland and Disney Sea so even on busy days you won’t miss out on all the fun at the parks. For those last minute souvenirs, there is a Disney store onsite. The property has all the facilities you would expect from a 4-star hotel with some added extras including an indoor swimming pool open year round and a garden pool that opens in summer. There are six restaurants and bars featuring Japanese, Chinese and international cuisine. If you are simply after a snack you can stop by the convenience store located in the hotel or the cafe bar for salads and sandwiches. A breakfast buffet is served in two restaurants each morning and offers options for all tastes. Family rooms are spacious with several layouts to choose from. They are on a dedicated floor where you’ll find lots of cute touches. We had a magic mirror in our room! 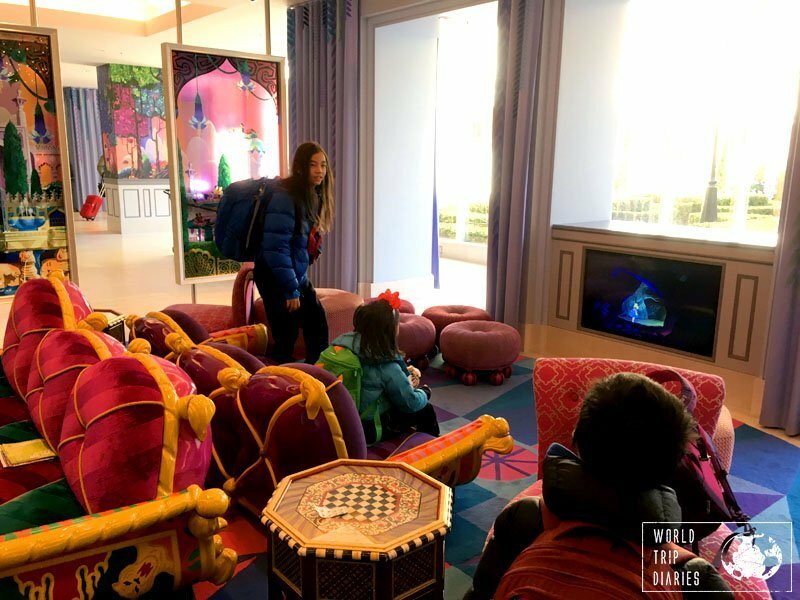 For the kids, there is a special lounge area for inside play near check-in that shows Disney movies all day long. Disney Hotel Guests can enter the park 15 minutes before the other visitors. You’re guided to one or another attraction or you can line up to the closed rides. It’s usually Toy Story Mania at Disney Sea and all of Tomorrowland at Disneyland but they do change depending on the conditions. You cannot get Fastpasses during those 15 minutes. We managed to ride Toy Story Mania twice (for the smaller kids and mom) or Toy Story Mania and Tower of Terror (for the older kids and dad). Well, only Toy Story Mania was open BUT they exited Toy Story Mania and went straight to line up for Tower of Terror. They rode before the regular people managed to get there, just as we rode Toy Story Mania twice before the crowds arrived. At Disneyland, we went to Space Mountain, the Buzz Lightyear ride, and the Monsters Inc ride super early. Tokyo Disney Resort isn’t actually in Tokyo. It’s in Chiba, one of the neighboring cities. From Tokyo to Tokyo Disney, there are many transport options. We almost always take the train, as it’s our favorite transport option, but you can take the bus (there’s a bus from Shinjuku Station Bus terminal) straight to the resort. They do sell out so buy in advance or go early if you plan to head straight to the parks. The train trip is easy, you’ll need to get to Maihama Station by either Keio or Musashino Lines. From there, you’ll either to take the monorail to the parks or walk. The monorail is great fun, but not necessarily the fastest or easiest option (and it’s paid). We went to Maihama Station and took the bus from the Disney Resorts Bus Terminal to the Hotel, but depending on where you’re staying, it’s easier to take the Monorail or even walk. The whole trip between Tokyo and Tokyo Disney takes around an hour, but it depends a lot on where you are. Well, this is not a choice, unfortunately. It’s still easier and faster to go from Tokyo do Disney by train or bus. Or a car, if you have one. After a long research, we decided to go by the end of January. It’d be best according to our schedule, the weather, and all. Even though the best time to travel to Japan is anytime, really, this is not the same for Disney Parks. During Japanese holidays, local holidays, and school holidays, the parks end up so crowded it’s hard to breathe. And summer (from July to September) is horrible there, as it’s very humid and super hot and super crowded. 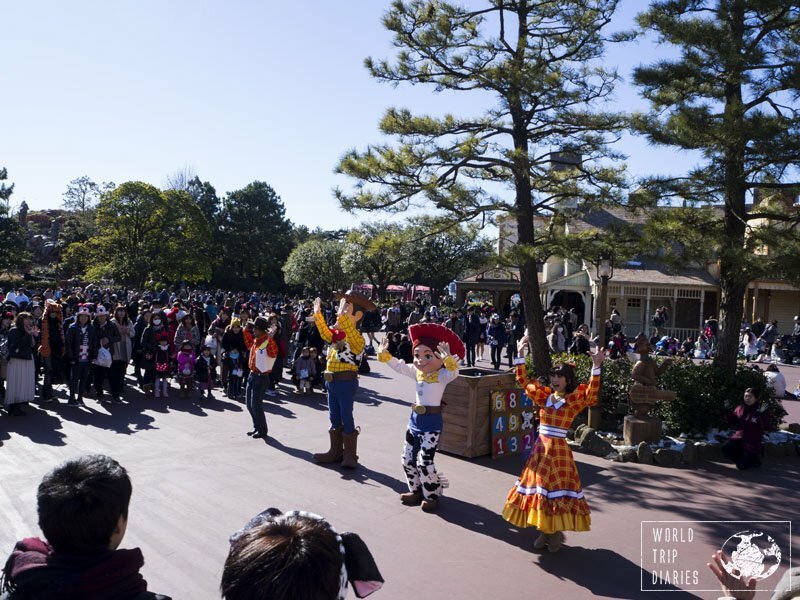 Tokyo Disney’s low season is in January and February, which means less crowd and shorter park hours. We decided it’d be the best time. Tokyo weather in January is very cold, but dry – less chance of rain, which is great. I can accept the cold, but cold and rainy is a bit too much and rainy and hot is not my favorite option. I mean, wearing a raincoat while boiling hot? No, thanks. That’s the reason why we think the best month to visit Tokyo Disneyland and Sea is in January. Cold but dry weather and fewer crowds. Win! Disney parks are a lot colder than the city of Tokyo in winter because it’s mostly open and very close to the sea. Find out ways to keep yourself warm, and enjoy a day in the park – and when you’re having fun, it’s a lot more pleasant. Click here to find tips on how to keep yourself warm during winter. Plus, at the end of this post, I’ve put up tips for surviving a winter day in the Disney Parks. Click to go straight there! 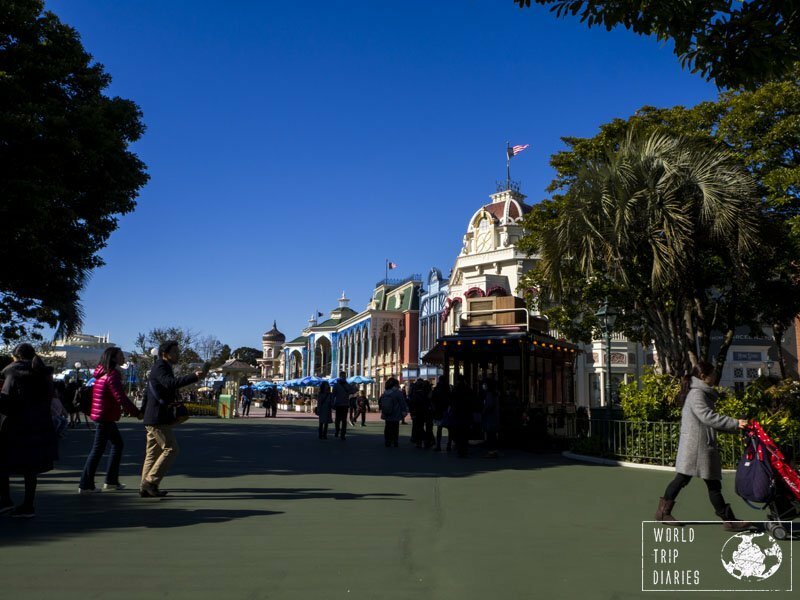 Toontown is probably the prettiest place – everything is so cartoonish and adorable! How not to love it? If you stay in a Disney Hotel, you don’t need to worry about it – you can buy your tickets at the hotel when you arrive or even in the morning before you head off to the park. For those who prefer to stay in other places (like we did last time, we went from our apartment in Tokyo to Disney Sea, you can read about it here), you can get your Tokyo Disneyland and Disney Sea tickets beforehand online or in convenience stores or Disney Stores. Alternatively, you can click to grab your tickets to Disneyland here! We actually bought our Disney Japan tickets online, on the official website. The only problem with this option is that you’ll need to print it out before going to the park. They do not accept e-tickets. We hate printing out stuff. one day pass: ¥ 7400 for 18+, ¥ 6400 for 12-17-year-olds, ¥ 4800 for 4-11-year-olds. Kids 3 and under are free. 2-day pass: ¥ 13 200 for 18+, ¥11 600 for 12-17-year-olds, ¥ 8600 for 4-11-year-olds and free for under 3-year-olds. The tickets are dated. Even when you’re buying 2 days straight, you need to choose when you purchase if you’re going to Disneyland or Sea on day 1, then on day 2. Unless you’re a Disney Hotel guest. Then you can start with a park hopper from day 1. (though I really think one park per day is enough. It’s useful when you have only one day for both parks). Another one of Toontown! I just love it! There’s a Disney Vacation Package option, with a hotel, park tickets, and more, but I found them a lot more expensive than buying everything separated so I didn’t dig into it. There are perks like you receive souvenirs, you get a restaurant reservation and more. See if they’re worth for you. The Fastpasses are the old-school time-slot printed paper passes and you can get only one per person at a time. You can get a second one after a certain time, so check your printed FastPass to see when you’re allowed to get another one. It only happens when it’ll take more than 3 hours or so from the time you got your Fastpass to the time of your ride. And if you don’t show up during your time-slot, you lose your FastPass, so make sure you’re there. We found that the Tokyo Disneyland Fast Passes, as well as the Disney Sea Fast Passes, tend to end in a few hours for most attractions (think Toy Story Mania, Star Tours, and the more popular stuff). Grab yours first thing in the morning before going to the attraction if you want one for these attractions. If you enter during the 15 early-minutes, then you can’t get a FastPass until the park is officially open, so enjoy your attractions and then run for a FastPass. * You’ll need everyone’s tickets to get FastPasses for everyone, but not everyone needs to be on the machines. You can take your party’s tickets while they line up somewhere. Since we went to Disneyland first, I’ll start with it today. Yay, we’ve finally arrived at the parks! There are many attractions and shows, but I’ll only list what we did so I can talk about them with property and expertise. If you wish to see the full list, check the official website. Storm Troopers Mochi, anyone? It was OK – though we couldn’t find the alien mochi this time! Sad, indeed. Staying inside to escape the cold is needed, and when it’s fun, better yet! 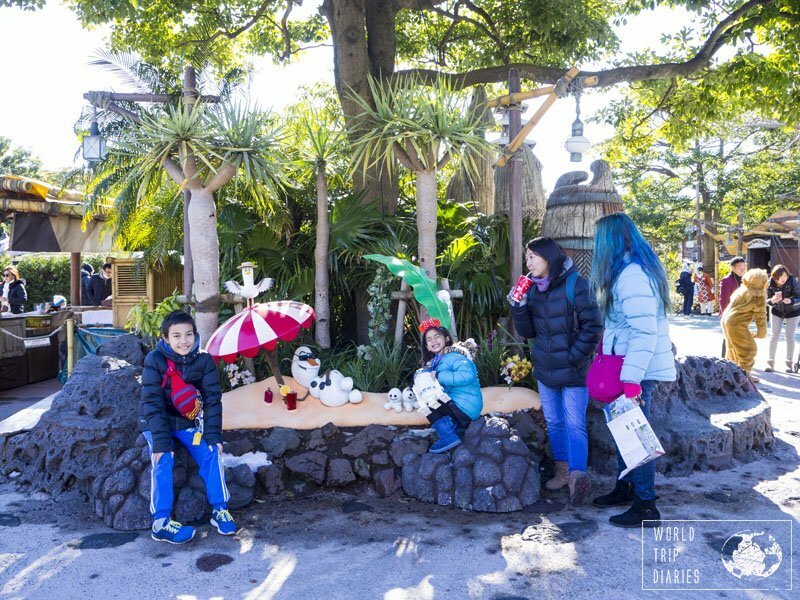 That’s the great thing about Tokyo Disney during winter – you can easily warm up! This is the place where we spent the longest. 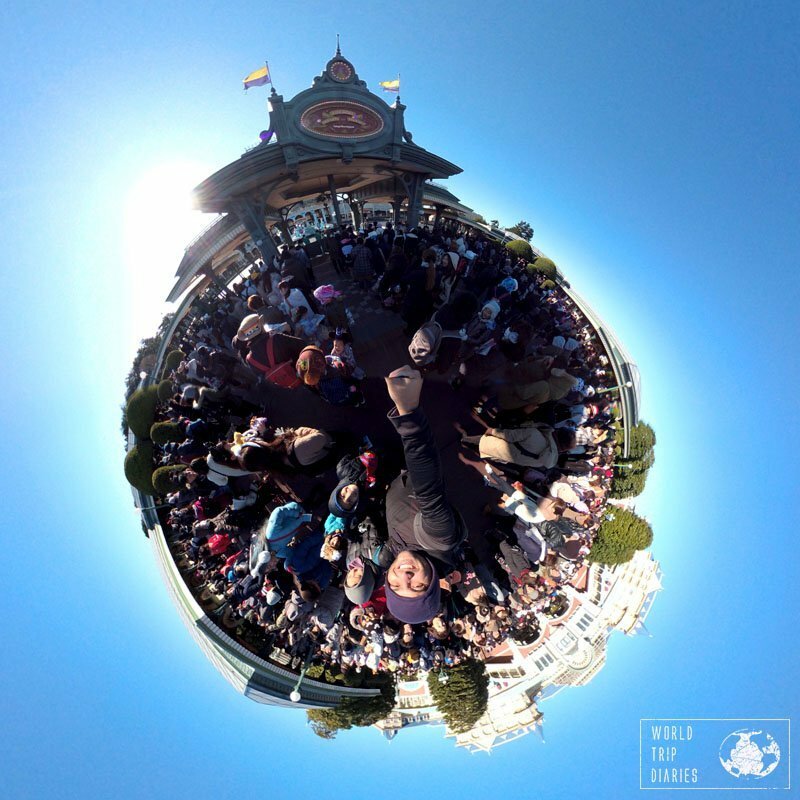 With Star Tours, Space Mountain, Stitch’s Encounter, Buzz Lightyear Astro Blasters, and Monsters Inc Ride and Go Seek, it’s got everything we love the most. It’s also the place with the best Disneyland Tokyo rides, in our opinion. We started our day in there because it was the park area opened for the 15-happy-early minutes for Disney hotel guests. Buzz Lightyear’s Astro Blasters – a fun ride where you shoot lasers at targets and score points. Fun for everyone, but the carts do spin around, so be ready. Anyone can ride it – perfect for every family! Space Mountain – a roller coaster in the dark. It’s delicious, and a bit longer and more thrilling than the Disney World version. Kids over 102 cm (3.4 ft) can ride. Stitch’s Encounter – A very cute and fun show where stitch talks to the crowd, something like Turtle Talk with Crush, but with Stitch. It’s all in Japanese, no translations anywhere. Anyone can go. Star Tours – for people 102 cm (3.4 ft) and over, you ride with C3PO and R2D2 through the settings and battles of Star Wars. AMAZING for every Star Wars fan. My kids love it. The only problem here: it’s all in Japanese. The whole line is super fun! Monsters Inc Ride and Go Seek – Kids must be able to sit without assistance to ride this one. It’s a cute ride where you use the lanterns to find the monsters hidden throughout the place. Cute ride and the talking robots are great. * Don’t miss the Pan Galactic Pizza Pot for entertaining robot talk for a fun meal. 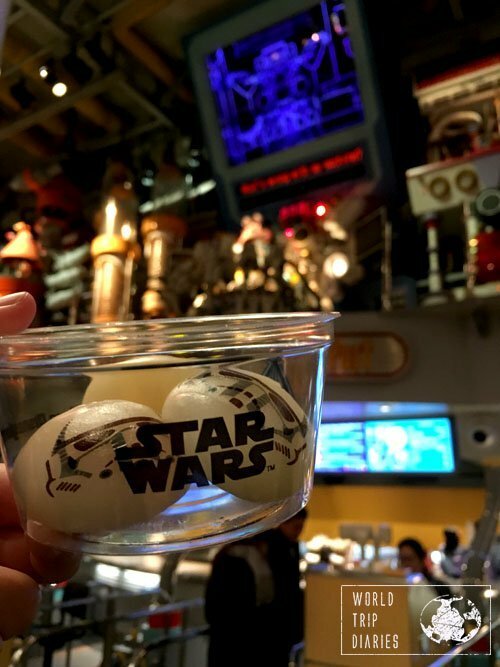 That’s where you’ll find the Storm Troopers’ mochi (rice doughs with a sweet filling). This is the Queen of Hearts restaurant from afar. Isn’t it just incredibly beautiful? If you want fairy tales, this is where you’ll find them. There are many rides for families, and this is where you’ll find the meet and greet of the princesses. I actually saw Cinderella, Maleficent, and Alice wandering around a few times before going to their meeting points. They take photos and talk to little kids while they walk around- so it may be better than waiting in line for the actual meet and greet. Since it’s the cute place where Cinderella’s Castle is, right at the entrance of the park, we stopped there too, of course. It’s very pretty and there was a lot of Frozen decoration (it was winter, after all), which was beautiful. We love Frozen. We didn’t meet any of the princesses because the lines were super, super long. And we’d already met most of them at Disney World anyway. Alice’s Tea Party – are the spinning cups ride. I didn’t ride it, but the kids did and they love it. Spun like crazies. All I saw was Melissa’s blue hair. Anyone who can take spinning things can ride it. Snow White’s Adventure – is a very dark and scary Snow White ride. I think they should change the name to the mean stepmother’s ride, because we barely saw Snow White, seriously. Coral was so horrified she refused to ride anything dark after that. Everyone who can sit unassisted can ride. Mickey’s PhilharMagic – it’s exactly the same as the one in Disney World, but there were no lines and it was fun, so… It’s a 4D ride through the Disney songs. Very well done and fun! Anyone can ride since it’s just a short 4D movie. Dumbo the Flying Elephant – Anyone who can sit without assistance can ride it. It’s Coral’s favorite ride because she just loves Dumbo. The older kids had fun bringing the poor elephant up and down as fast as they could. It’s not worth the line unless you have a Dumbo crazy person in your family. * Don’t miss the Queen of Hearts restaurant. It’s Alice themed, so incredibly beautiful, and the food is actually good. There are a lot of options, and it ends up being expensive, but it’s worth for a warm and nice place (or a cold place, during summer) to sit and rest for a while. The desserts were beautiful! It’s the area with the Rivers of America, and its greatest attraction is the Splash Mountain. Our last visit was during winter, so we skipped it altogether. Goody’s house was adorable! I wish we could see his house per se, not just play the game. The place with the lovely characters houses, Mickey’s and Minnie’s meet and greet, and some amazing photo ops. It’s very worth the stop to feel like a cartoon! Try escaping the jailhouse! Fun! The older kids didn’t want to stop there, but Coral and I did, so we stopped. It’s so adorable and cartoonish! Try to open every door, every box, every window, to mess up with everything. Seriously, there are so many fun surprises there! Goofy’s Paint and Play House – Goofy’s house with a weird pointless painting game. Coral liked it but the rest of us finished not getting what it was about. It’s cute, but not worth the 30-minute line. Chip ’n Dale’s Tree House – Obviously, Chip and Dale’s house. It’s cute and fun for little kids, great for taking photos. Donald’s Boat – cute and fun, Donald Duck’s boathouse is full of little surprises. Take your time, and try to do it all. 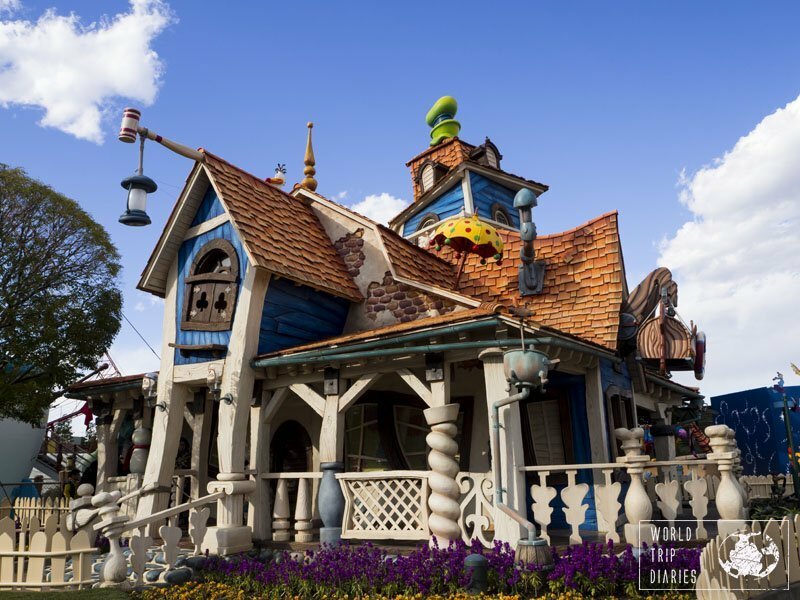 Minnie’s House – it was the prettiest, and the more detailed. You could open the cabinets, the fridge, turn on the oven or the dishwasher, sit on the couch, play on her computer and more. It’s where she appears for her greeting times, but she wasn’t there. It’s overcrowded but fun. We didn’t go see Mickey’s house because he was there and the waiting lines were over 90 minutes. Roger Rabbits Car Toon Spin – a Roger Rabbit (probably the only in the park) themed ride. The line is prettier than the ride itself, but if there isn’t a line, it’s worth the visit. For everyone who can sit without assistance. We missed Big Thunder Mountain but we had Elsa. Which would you choose? This is the Wild West American town, pretty fun with loads of cute things to see. Our only reason to go there was Big Thunder Mountain. Since I wasn’t feeling too well, I decided to stay outside and Joao, who didn’t like it last time he rode it, decided to stay with me. So we watched a Frozen Parade. Haha. Big Thunder Mountain – a roller coaster for people over 102 cm (3.4 ft). It’s super fun and exciting. Coral LOVED it and wanted to ride it again later in the night. * Don’t miss Jesse and Woody’s country music show. They take photos with the guests after the show! An early 20th-century small American town themed area. It hasn’t got much, but it’s super pretty. Pirates, jungles, and more. That’s Adventureland. The main rides are the Pirates of the Caribbean and Jungle Cruise. We had no reason to visit it, except that it was on the way, so we stopped there. Angelo took the kids to the Pirated of the Caribbean while I bought and ate my R2D2 popcorn. Pirates of the Caribbean – A ride about the movies with the same title, for everyone who can sit unassisted. We don’t even like Pirates of the Caribbean, but they said the robots are pretty good and they have very smooth human-like movement. 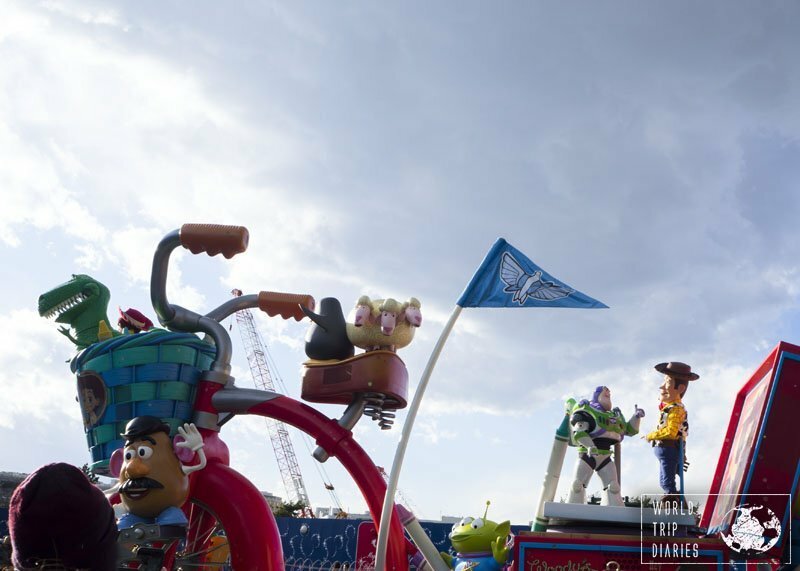 At the Happiness is Here parade – my favorite, Toy Story, of course. When they make the Big Hero 6 car, I might change favorites. 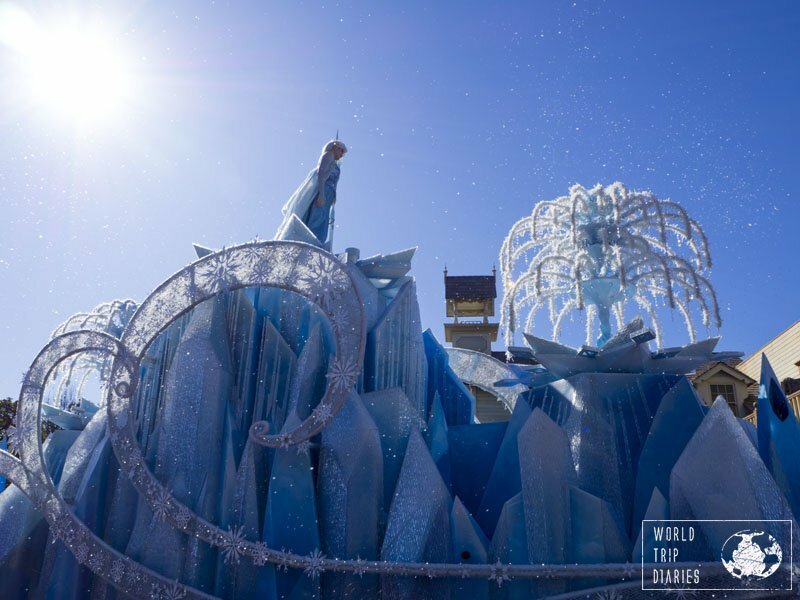 Frozen Parade – A fun parade with all the characters from the movie singing a mash-up version of all the Frozen songs. I liked it, and Hans was exactly the same as the movie. Joao (12), on the other hand, was quite bored. I don’t know if it was because I was singing and dancing and taking photos. Who knows. Happiness is here – It’s the special parades with a lot of the Disney Characters, including Mary Poppins, Bert, and the chimney cleaners. That little song, though, pretty annoying. Check out the video at the top of the post to see a bit of it! 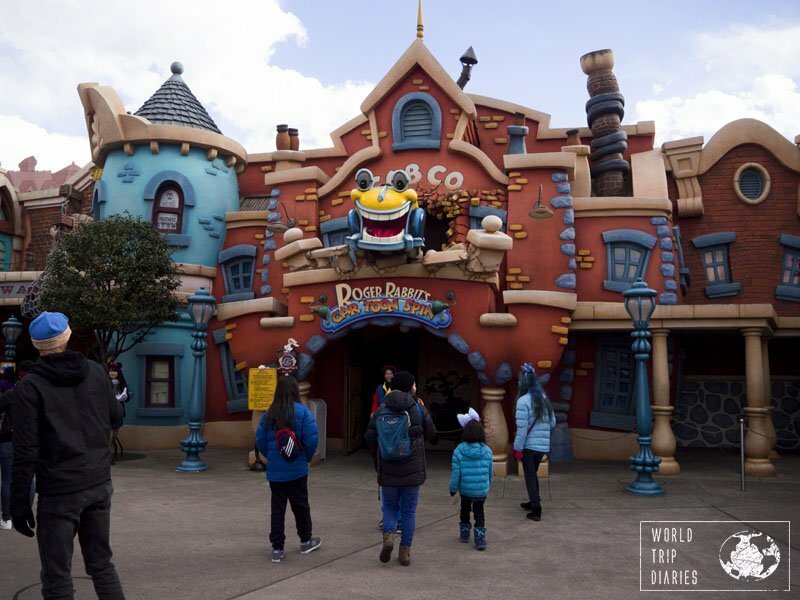 Our second and last park day was spent at Tokyo Disney Sea and here are the rides and foods we tried while we were there. A bit more of the amazing Toy Story Mania ride – because I can’t handle myself! A fishing village port themed area, it’s beautiful. It has Toy Story Mania and Tower of Terror, so you’re sure to stop by. It’s one of the best places to find characters – Toy Story ones. Tower of Terror – People over 102 cm (3.4 ft) can ride this horrifying elevator drop. Melissa (14) loves it and she wants to go every time, so Angelo goes with her while the rest of us go to Toy Story Mania, right beside it. It’s dark, scary, and no thanks. Ride early in the day or grab a FastPass early on. Toy Story Mania – The best ride in the world, where you shoot pies, pop balloons, break plates, and all on a 3D ride. Everyone who can sit unassisted can ride. These are the longest lines in the park. Ride it first thing in the morning or get your FastPass early. They tend to finish in the first hours of the park. The lines here are so pretty, though, it’s very worth the wait! Trans Steamer line – A boat line that takes you from one port to the other. You can’t choose to stay for 2 stops, you must leave on the next stop, but still, a good thing. Anyone can ride. * Don’t miss the shell ice cream sandwich sold at the kiosk right in front of Tower of Terror. They’re super cute! Can you, now can you, find the seals? Ha, they are there, I promise. With the new Nemo & Friends SeaRider and Aquatopia, it’s a fun futuristic marina area. It’s worth the walk even if you’re not riding. Aquatopia – a ride in little boats that threaten to wet you a lot of times, but doesn’t. Well, during summer times, you can choose if you want to get wet or not. For anyone who can sit without assistance. Nemo and Friends Searider – it’s a lovely new ride. People over 90 cm who can sit without assistance can ride this 4D ride through the sea with Nemo and his friends. Super cute. * Don’t miss the ‘Finding Dory’ seals on the water! I don’t know why, but we’re always in the Arabian Coast when it’s getting dark. Taking photos there is always harder! A 2 story carousel, anyone? This is Aladdin and Jasmine’s place and every detail is perfect and beautiful. We always eat there – curries, curry popcorn, dried fruits? Yes, please. Caravan Carousel – fun 2-story carousel. From the second deck, you have great views of the Arabian Coast. Almost no lines, since it fits so many people. Anyone who can sit unassisted can ride it alone, and those who can’t can go with their guardians! Why not ride Genie? Jasmines Flying Carpet – Dumbo carpet version. Seriously, why? * Don’t miss the Sully Dumpling. I don’t know why it’s here, but it is and it’s cute. Not super good, but OK.
Mermaid Lagoon – that’s the outside. The inside is a bit darker but still adorable. This is probably the best (and maybe only) place for little kids. There are the very slow-moving ‘boring’ (as my tweens and teen said) rides, but it has Ariel’s grotto, an incredible playground, and the best: it’s all covered and with air conditioning, so it’s comfortable during winter or summer. Jumping Jellyfish – basically a Dumbo ride that goes up and down instead of around. Those who can sit unassisted can ride it. Nor worth the line unless you have little kids who really want to. Flounders Flying Fish Coaster – a pretty fun roller coaster for kids. Kids must be over 90 cm and be able to sit without assistance to ride it. It’s a mild roller coaster, so even those who don’t like them can ride it. 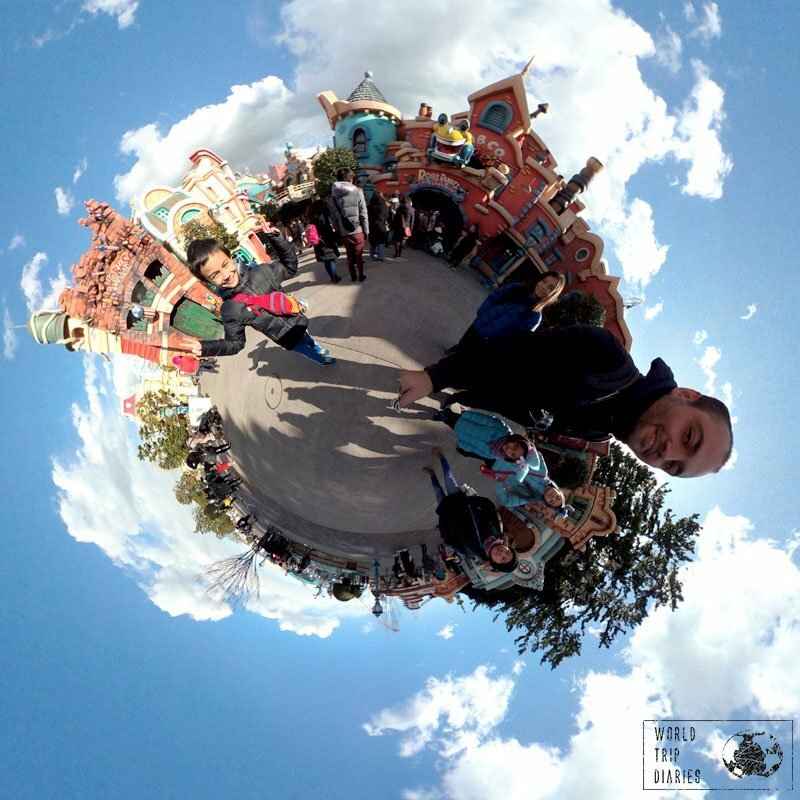 Blowfish Balloon Race – Dumbo ride version 3. Well, it was warm inside! Mermaid Lagoon Theater (King Triton’s Concert) – a concert with Ariel, King Triton, Sebastian, and Flounder. Fun for everyone, but it’s all in Japanese. The kids had lots of fun with the Japanese version of Under the Sea. This is Indiana Jones’ ride -it looks pretty cool. We went there once but this time, Coral refused to get near. haha. In this area, you feel like you’re inside Captain Nemo’s (from 20 000 leagues under the sea) island and inside a volcano. There’s Journey to the Center of the Earth, a hit of a roller coaster! 20,000 Leagues Under the Sea – a kind of a submarine ride. It’s very dark and a bit scary, but everyone can ride it since it moves so slowly. The lines are always short, so great for a rest. Journey to The Center of The Earth – a roller coaster through the mountain for people over 117 cm (3.8 ft). It’s a bit scary, and the lines are long, and FastPasses run out quickly too – around lunch time at most. * We ate at Vulcania Restaurant, which is a Chinese style restaurant. The food wasn’t good, but it was very cute. 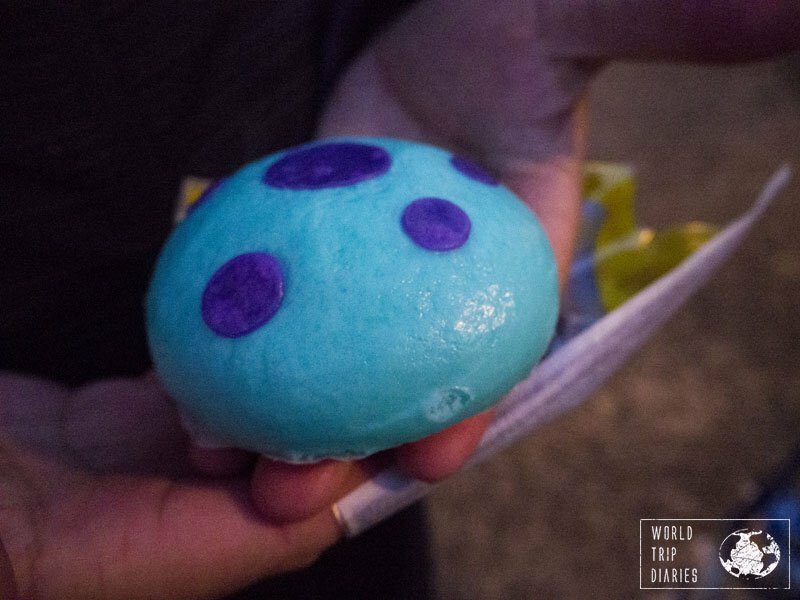 The Monsters Inc meal is adorable – but it tasted bad. With Indiana Jones Adventure: Temple of the Crystal Skull and Raging Spirits, it’s a place not for the littlest. Coral was 5 and she was terrified when we crossed it after sunset. For the older kids, A LOT OF FUN! 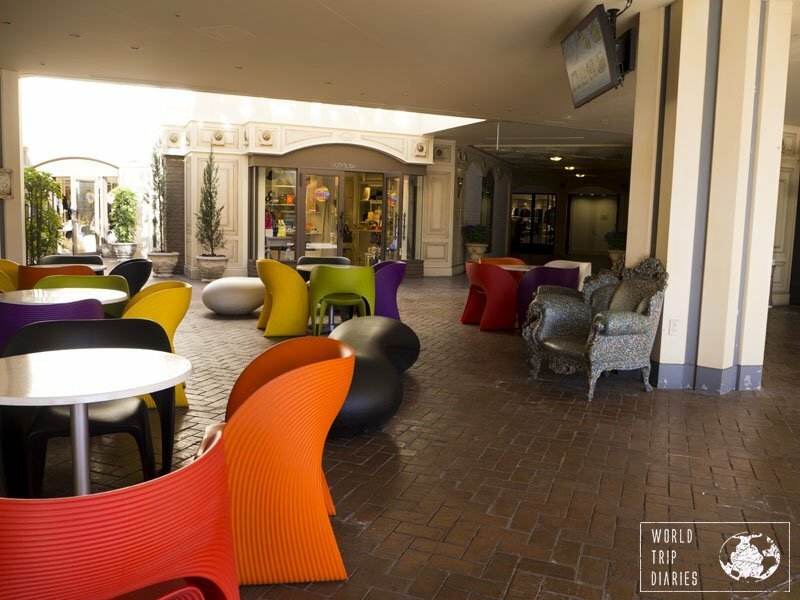 With the incredible Fortress Explorations and the Venetian Gondolas, it’s a place to unwind, rest, and feel like you’re in Italy. The Tomato and Herbs popcorn is pretty good! 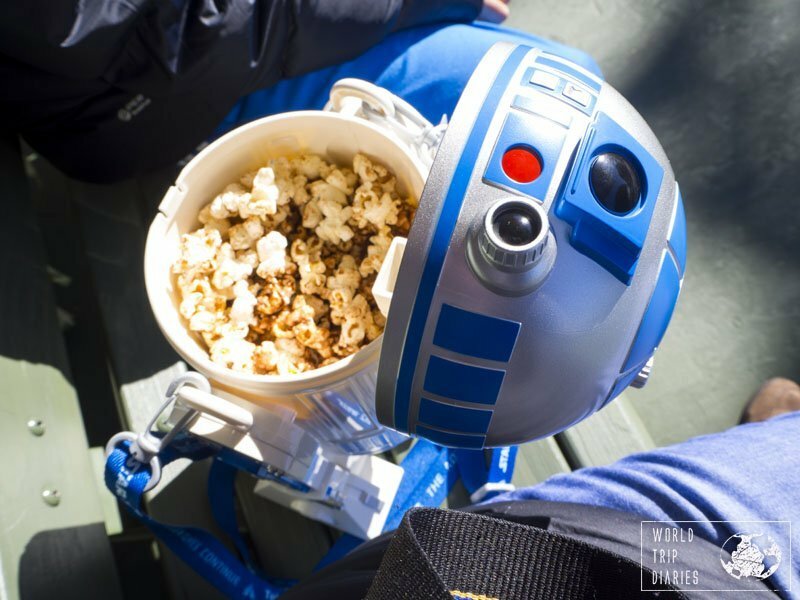 Just the most adorable popcorn bucket ever! We usually give them out because we have no way to carry, but this one was sent home – just too cute. If you’re thinking ‘Are Tokyo Disneyland rides in English?’, I have news for you. They’re all in Japanese. None of the rides had any kind of subtitles or anything for people speaking other languages. It’s a bit disappointing as a lot of the people there were tourists. The cast members also spoke very little or no English, so not very helpful. We enjoyed it a lot, even though Angelo and the kids couldn’t understand most of what was said, but a little English would’ve been helpful. There are maps and the descriptions of the food at the restaurants in English and those are good, but not enough. All in all, most rides don’t need any understanding of the language to be enjoyed, but some do. Even though you can get the general message, it’s not as much fun. Besides the parades, characters appear everywhere to take photos, play with the crowds, or do little shows. It’s fun and they’re everywhere! If you have a small child who can’t ride something, you’ll use this a lot. It is the Child Swap, where one adult ride while the other watches the child, and then they can swap without the need to take the whole line again. It’s very useful when the adults want to ride but there’s a kid who can’t or doesn’t want to ride. Talk to the staff at the beginning of the line! Tokyo Disneyland or Disney Sea? Well, this is a hard question to answer, as it’s super personal. I recommend you do both parks, but if you have to choose one, I’d ask what’s your family like. If you have mainly little kids (under 8) and/or have never been to a Disney park before, go for Disneyland. That’s the park where most rides are enjoyable for everyone, and where the Disney ‘spirit’ is. 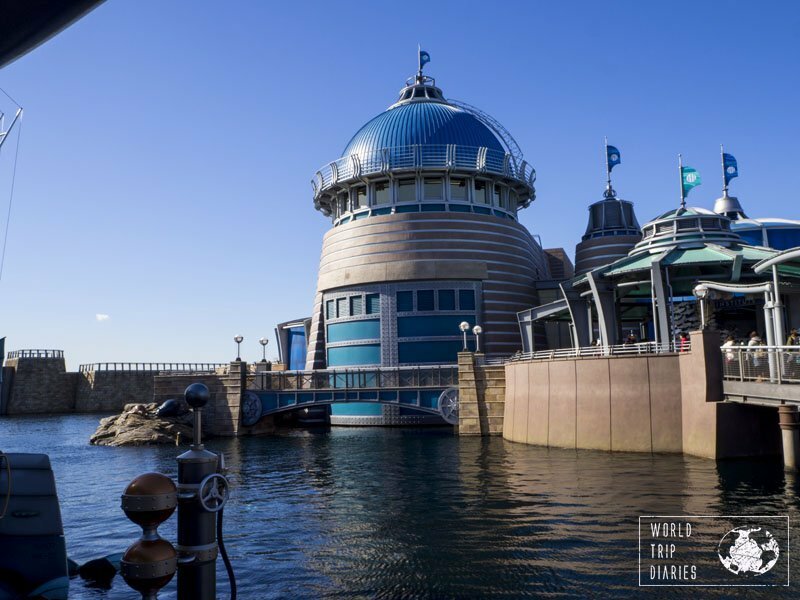 If you’ve been to a few Disney parks before and you have mainly older kids OR you have a Nemo or Ariel obsessed child, then Disney Sea it is. It’s a unique park, unlike any other Disney park in the world. Now, when it comes to Disneyland or Disneysea for toddlers, I’d say Disneyland. Or for people with a big age gap between the kids. 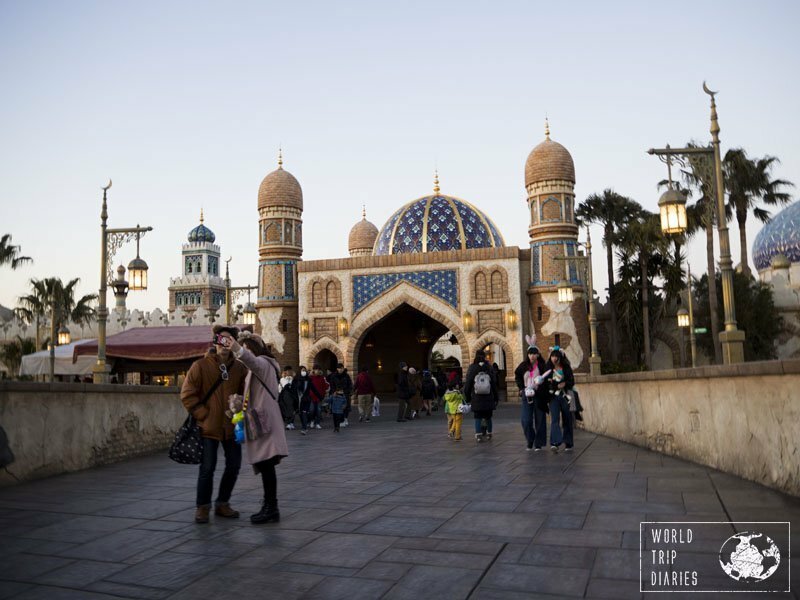 Disneyland is fun for everyone, whereas Disney Sea has the places for the little kids and the places for the older kids, so you mostly can’t do it all together (or it won’t be as fun). Seriously don’t miss those. They’re great. Even though it’s a hit and miss, as not all flavors are gonna be good for everyone, I can assure you that some are pretty good and others are pretty lame. Most of the popcorn stands sell caramel popcorn, which is good and sweet. We tried the curry popcorn, which is also delicious. The milk chocolate was weird and tasted a bit like cheese. We ate it, but it wasn’t too nice and not repeated. The soy sauce and butter flavor popcorn was the worst and we threw it out. Seriously, the 6 people in our family hated it. And, lastly, the tomato and herbs, found in the Mediterranean Harbor, was a good surprise. It’s a fake pizza flavor, you know? Like the chips or crackers that are pizza flavor? Well, that. We only found the sea salt flavor in Mermaid Lagoon but didn’t get it. We were all in for different stuff. You can buy a bucket and refill it for ¥ 520, or you can buy just the popcorn in the regular cups. Since we’re in 6, we eat a lot, we always buy the bucket. They’re great as a souvenir and we use them at home. It was a bad choice, though, buying the bucket full of soy sauce popcorn. Yuck. There are many different buckets throughout the park: find one you enjoy and buy it! * You can buy one bucket and use every time you visit the park – be it next year or tomorrow. Winter = Frozen specials. There were Sneezies and Olafs everywhere! Well, it’s not easy, but it’s highly doable and very worth it! 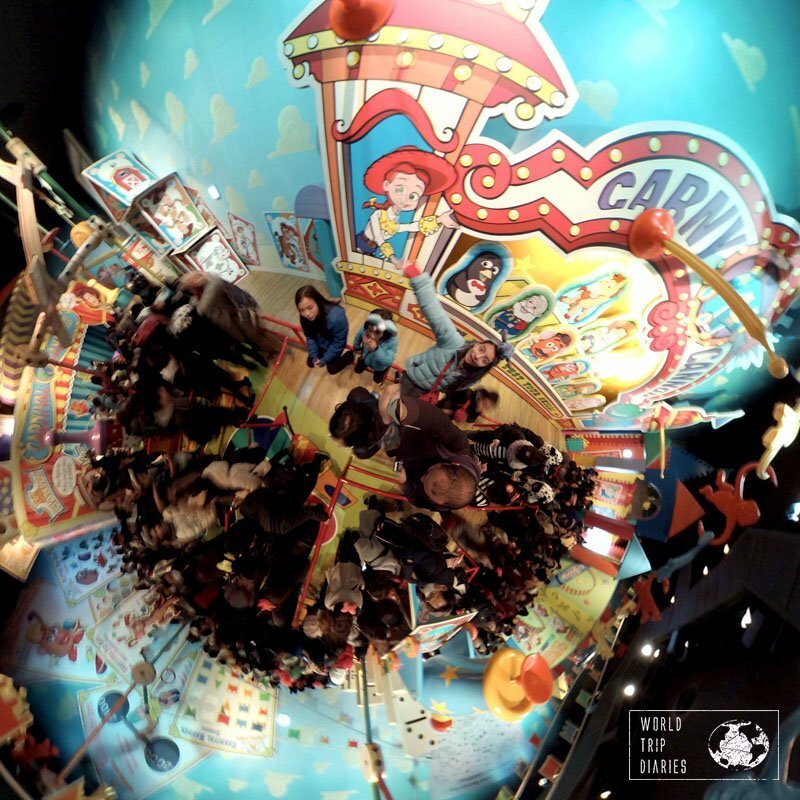 We also have a post about a day in Universal Studios Japan (Osaka) during winter. Click here to see it! You’ll have to dress warm (and make sure everyone does the same). Seriously ask and remind everyone if they’re wearing thermals, take gloves, hats, and a spare set of socks and raincoat – in case it rains. Check the weather forecast in Japan before you go. They’re usually very accurate, so you may be able to leave raincoats behind if it’s not going to rain. Kairo or hand warmers are great. Take a few and hand out to everyone. I had around 5 warming me up: one inside the neck warmer, one inside each glove, on my belly, on my lower back. Seriously. It’s lovely. The kids didn’t have the patience, so they had 1 or 2 each, which they moved from one place to the other. Take them. Life-saving for wintery days. If I could, I’d have bought the ones for the shoes too. My feet were super cold at the end of the day, even though I was wearing 2 pairs of socks and a nice boot. Sully bun, anyone? Angelo tried it and said it wasn’t good BUT it was so cute it was worth it. Do you choose food by the looks too? Wear neck warmers! Forget scarfs, neck warmers are better. They may not be good looking, but you can ride every single ride with them whereas you’d need to remove scarfs on most rides. I need to say that my neck and lower part of the face were very warm, even on roller coasters. There is no wifi in the parks. Take a rental mobile internet or just be offline! The internet at the Disney Hotels was great, but the lack of internet in the parks was a bit sad. There are lockers at the entrance of both parks, plus near the bus stops, and at the Maihama Train Station. Choose the best location for you and store your luggage since you can’t take large bags to the park. On the morning after the parks, we had a morning to ‘rest’ in Ikspiari. It’s a shopping mall, but it offers many resting places like that one. It was a bit cold, though. For Disney fans, it’s worth the trouble, the money, the cold. My kids love everything Disney, so we have lots of fun at the parks. 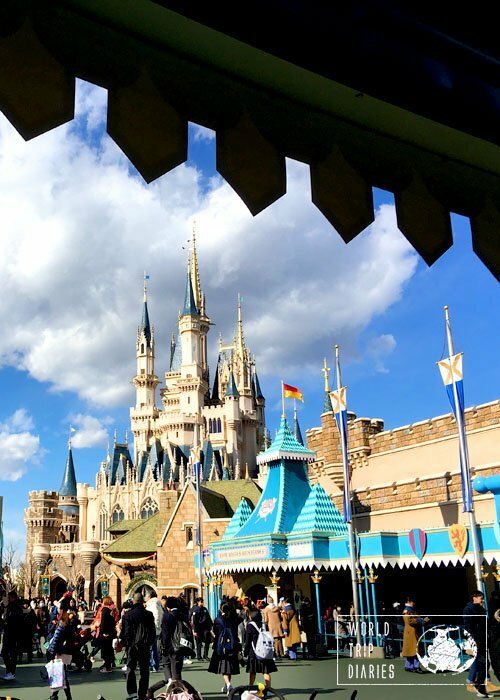 The Disney Hotels may be worth due to the convenience and to keep the Disney vibe throughout the stay – especially for those spending more than a day at the park! To see how our visit to Disney Sea during summer was, click here!